Whether you call Las Vegas, Henderson, Boulder City, or anywhere else in Clark County, NV your base of operations, and whether your company has been conducting business for years or just starting to formulate your company’s plan of attack, we feel an important first step that needs to be addressed is securing the proper insurance program for your company’s particular needs. Having your insurance in place before you start operating will protect your Clark County, NV business from an unexpected disaster or claim. When sitting down with our clients to go over their insurance options, our experienced brokers will ask our clients numerous questions with regard to our client’s business operations, so we can present them with the proper insurance program to fit their Nevada company’s needs. One of the very first items we discuss with our clients is General Liability Insurance Coverage. It doesn’t matter what your company does, whether it is a General Contractor, Trade Contractor, retail or wholesale operation, product distributor or manufacturer, e-commerce, web designer, tech industry, or one of the numerous companies that are based in Clark County, NV, we feel that a most important thing should be to acquire a General Liability Insurance policy which is in the company’s best interests. In fact, having a Commercial General Liability Insurance policy will help protect your Clark County, NV company from claims such as property damage, negligence related to their business activities and claims of bodily injury, and, in addition, it will provide legal defense for your company should it be involved with a claim being filed against your business. Depending on what particular industry your company is in, there are several additional coverages you may want to consider for your Clark County, NV company including Property Insurance Coverage, which is important if your business has an office or building with equipment, business personal property, or stock or inventory. Another insurance coverage you may want to look at, especially if your company does business over the web or if you store your client’s data on your company servers, then acquiring a NV Cyber Liability Insurance Policy is an absolute necessity considering the recent vast amount of hacking that has taken place. Taking into consideration that most companies have employees, and if you are one of those companies, it would be a wise investment to purchase Employment Practices Liability Insurance in Las Vegas, or EPLI for short, especially when you consider that the average amount paid on these types of claims approaches six figures. Does your company distribute or manufacture some type of product? If it does, a Product Liability Insurance Policy should be included in your overall insurance plan. If your corporate structure includes a Board of Directors, then it is imperative that you protect your directors by having a Directors & Officers Liability Insurance policy. If your Clark County, NV company provides a professional service, having an Errors and Omission Insurance Policy will protect your LV business from claims of failure to perform your company’s professional services or from your company’s negligence. As you can surmise, no matter what your Clark County, NV company does for business, there are a vast array of insurance options from which to choose to fit your company’s particular needs. Because every company is unique, no one insurance program will fit all. The brokers at PJO Insurance Brokerage will take the time necessary to explore all the aspects of the client’s business, what the risks may be, and will create a proper insurance plan based on this information so your company can be protected. We also understand that certain companies are going to be more difficult for which to secure insurance coverage, and that’s why, as an independent agency, we have access to numerous markets, so finding that hard- to-place coverage for your Clark County, NV company may be more likely. 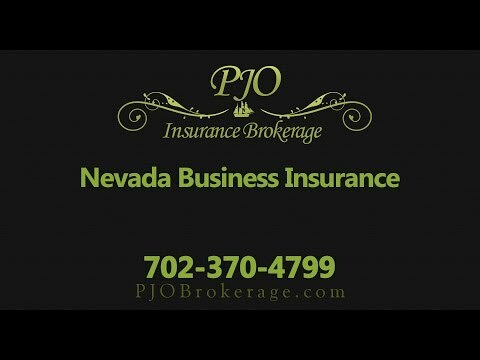 If you would like to explore how having the professional and experienced brokers at PJO Insurance Brokerage create an insurance plan for your Las Vegas/Clark County’s business insurance coverage requirements, please call us today to set an appointment. We look forward to hearing from you.